To Cite: Alavian S M, Showraki A. Hepatitis B and its Relationship With Oxidative Stress, Hepat Mon. 2016 ; 16(9):e37973. doi: 10.5812/hepatmon.37973. Context: Despite the great breakthroughs we have witnessed in the last 50 years in the prevention, diagnosis, and treatment of hepatitis B, we are still far from eradicating or even curing the disease. Achieving further progress in controlling this disease will not be possible without discovering the exact pathogenesis behind it. One prime suspect in the pathogenesis of various diseases is oxidative stress. This review will exclusively explore hepatitis B in the context of oxidative stress to obtain a more comprehensive clinical perspective on its pathogenesis and eventual medical therapy. Evidence Acquisition: We systematically searched PubMed, Google Scholar, Web of Science, EMBASE, and Scopus using an extensive list of keywords in the following three categories: 1) Hepatitis B and oxidation 2) Hepatitis B and antioxidant system 3) Effects of approved anti-hepatitis B drugs on redox status. All relevant articles were obtained and reviewed carefully after the exclusion criteria were deployed. Results: There is great evidence indicating extensive oxidative stress occurs in hepatitis B. This oxidative stress takes place on multiple levels, including lipid peroxidation, DNA oxidation, protein oxidation, and reactive oxygen and nitrogen species production. However, there are also conflicting results with regard to antioxidant therapy and antioxidant status in hepatitis B, some of which may be explained by the concept of “compensatory gaps.” Nevertheless, further studies are indicated to reach a more thorough judgment. Conclusions: Despite the presence of vast oxidative stress in hepatitis B, antioxidant therapy is not always effective as a treatment strategy, especially considering that antioxidants can act as “double-edged swords” or antioxidants; if not used at the right time or place or in the right combination, these substances can easily become pro-oxidants. Therefore, several studies will be needed to determine suitable antioxidant therapies. We propose the “2-step Combined Antioxidant Adjuvant Therapy for hepatitis B (2CAAT Hep B)” as a new strategy for antioxidant adjuvant therapy. We also suggest developing an international platform and database for antioxidant adjuvant therapy in hepatitis B (IPAATH and IDAATH) to canalize this field of research in a standardized direction, especially when complexity is a problem. Although it has been 50 years since the discovery of the Australian Antigen (i.e., HBsAg) by Nobel Prize Laureate, Professor Baruch Samuel Blumberg (1925 - 2011) (1), the hepatitis B virus still affects approximately 350 million individuals around the world (2) and is responsible for the deaths of about one million people annually (3). We have seen great progress in the prevention, diagnosis, and treatment of hepatitis B in the past few decades; however, we are far from eradicating or even eliminating the disease (4). The production of the first hepatitis B vaccine in 1983, which was called the first anti-cancer vaccine by the world health organization (WHO) (4), offered hope in controlling and preventing the disease. The outlook was further enhanced by the production and development of the first antiviral drugs in later years. With the implementation of new treatment strategies, some achievements have been made in controlling the disease, yet we are far from eradicating it. Hepatitis B remains the number one cause of liver cirrhosis globally (5). Moreover, hepatocellular carcinoma (HCC), which is the 5th most prevalent cancer and the 3rd highest cause of cancer-related death, is one of hepatitis B’s major complications (6). Currently, only six drugs have been approved by the United States (US) food and drug administration (FDA) for the control and treatment of hepatitis B (7). These drugs include Interferon alpha (i.e., conventional INF-α 2a, conventional INF-α 2b, and peglayted INF-α 2a), Lamivudine, Adefovir, Entecavir, Telbivudine, and Tenefovir (7). Even though these drugs have been partly successful in decreasing liver cirrhosis and HCC, they cannot eradicate the virus from the host’s body and instead prevent its replication (8). In other words, the infection remained. In addition, facts such as medical costs, drug adverse effects, drug resistance, and treatment failure have made controlling hepatitis B more challenging (4). All currently available oral drugs must be consumed indefinitely, which carries significant costs and is associated with low patient compliance (4). Thus, there is a major need for the development of newer drugs and treatment strategies. However, this need cannot be met until we understand the exact pathogenesis of the disease. One topic that has attracted great attention in the pathogenesis of both infectious and non-infectious diseases is “oxidative stress.” This subject has gained such momentum that a new field of research called “Redox biology” has emerged (9). Normally, there is an equilibrium in the oxidation-reduction system in all of our body’s cells that is crucial to the cells’ survival (10). If this equilibrium is somehow disrupted, either the oxidant levels increase or the antioxidant levels decrease, which is termed a state of “oxidative stress” (11). This condition is hazardous to the cell and will lead to vast injuries to various macro-molecules within the cell, such as DNA, proteins, and lipids (12, 13). As a result, oxidative stress is currently a major suspect in the pathogenesis of an extended spectrum of diseases and cancers (11). The investigation of the exact mechanisms of oxidative stress in different diseases could shed light on many unknowns and solve unanswered enigmas. This increase in our level of knowledge on hepatitis B’s pathogenesis will eventually lead to better and more effective treatments or even cures. The aim of this review was to clarify the role of oxidative stress in hepatitis B so that its results could contribute to a better understanding of the disease and its improved treatment or cure. To gather data and information for the current review, we systematically searched PubMed (1940 - 2016), Google Scholar, EMBASE (1947 - 2016), Web of Science (1980 - 2016), and Scopus (1995 - 2106) for relevant articles without any date limitations. The extensive search was done using the following keywords: hepatitis B, viral hepatitis, oxidative stress, redox, oxidation, antioxidants, antioxidative defense, antioxidant status, antiviral drugs, lipid peroxidation, protein oxidation, DNA oxidation, ROS/RNS, ROS-producing enzyme, exogenous antioxidant, endogenous antioxidant, viral liver disease, HBV-associated hepatocellular carcinoma, HBV-related cirrhosis, interferon alpha, Lamivudine, Adefovir, Entecavir, Telbivudine, and Tenefovir. The search was performed systematically in three separate fields: 1) hepatitis B and oxidation status, 2) hepatitis B and antioxidant system, 3) and the effects of approved anti-hepatitis B drugs on redox status. In each field, the pertinent information and studies were obtained using a comprehensive list of relative keywords. Figure 1 demonstrates the search structure that was deployed. All clinical studies were included for review to obtain the most comprehensive outlook possible, except for those with the following conditions: 1) articles in a language other than English that did not have English abstracts; 2) studies on liver diseases other than hepatitis B; 3) studies that included the co-infection of HBV with human immunodeficiency virus, hepatitis C virus (HCV), etc. ; 4) consumption of non-approved antiviral drugs; 5) the anti-HBV effect of substances that are not considered to be antioxidants; 6) studies with exposure to environmental factors, such as aflatoxins; and 7) studies that included a co-analysis of liver diseases (i.e., HBV was not separately analyzed). Reactive oxygen species (ROS, such as superoxide, hydrogen peroxide, singlet oxygen, and hydroxyl radicals) and reactive nitrogen species (RNS), which are induced by various endogenous (e.g., mitochondria, enzymes, etc.) and exogenous (e.g., chemicals, tobacco, ultraviolet rays, etc.) factors lead to widespread oxidative damage to different biomolecules (11), including lipids, proteins, and DNA. ROS and RNS are highly unstable and evanescent species; although these qualities make them great cellular signaling tools, they are particularly arduous to measure (14). Therefore, to assess their oxidation status, we can measure their oxidation “byproducts,” which are imprinted by the ROS/RNS on proteins, lipids, and DNA. Due to their abundant reactive double bonds (15), lipids are vulnerable to be attacked by free radicals, which could lead to the loss of membrane function (due to the presence of phospholipids). Furthermore, lipid peroxidation end products alone may also damage DNA and proteins (16). The most studied lipid oxidation end products include malondialdehyde (MDA), isoprostanes, acrolein, and 4-hydroxy-2-nonenal (HNE). Among them, MDA is usually measured as an oxidative stress indicator due to its stability (17). Many studies have confirmed the presence of lipid peroxidation in hepatitis B infection (18-46). These studies mostly measured MDA as an oxidation marker, which was significantly higher in patients with hepatitis B infection compared to healthy individuals (Table 1); a marker that was positively correlated to alanine aminotransferase (ALT) (23-25, 30, 31, 41), HBV-DNA (23, 32), total and direct bilirubin (28), serum bcl-2 (this study combined hepatitis B and C patients) (47), gamma-glutamyl transpeptidase (GGT) (31), serum iron/ferritin (44), and liver ultrasonography findings (coarse texture) (28) in some studies. Although another study demonstrated a significant increase in the MDA levels of chronic hepatitis B patients, it did not find a significant difference between inactive HBsAg carriers and controls (48). Additionally, Jasim et al. (49) showed a non-significant MDA increase in the primary stages of non-acute hepatitis B infection. aNo significant difference; >>, significant increase; <<, significant decrease. Overall, the presence of such strong and extensive evidence has made lipid peroxidation and its byproducts major suspects in activating hepatic stellate cells and leading to active fibrogenesis (50). However, one interesting yet conflicting study performed by Severi et al. (51) used the HBV-inducible HepAD38 cell line to compare the effects of HBV replication on cellular characteristics. In their in-vitro model, HBV production was under the control of a tetracycline-regulated pro-motor. In other words, the absence of tetracycline in the media induced viral production, whereas the presence of tetracycline ceased the viral replication. Therefore, one can directly and correctly compare the effects on host cells that were solely caused by HBV replication. Severi et al. (51) eventually showed that although HBV replication produced oxidative stress, it did not significantly affect lipid peroxidation (MDA levels). Thus, this fact may raise the question that lipid peroxidation might also take place elsewhere outside hepatocytes. This question becomes bolder with a study reporting an increased prevalence of carotid atherosclerosis in hepatitis B virus carriers (52). All these previous studies suggested a significant rise in the plasma or erythrocyte MDA levels, and none measured the MDA levels in hepatic tissue. We also must not forget that the HepAD38 model did not seem useful in investigating the long-term effects of HBV replication (51). However, even more compelling was a study on human HCC, which included liver biopsies from HBV-positive-HCC patients. This study reported decreased MDA and conjugated dienes at the site of “carcinoma tissue” compared to “matched surrounding non-tumor tissues” in the HBV-positive-HCC group. More overwhelming was the fact that the tumor and the surrounding non-tumor tissues in HBV-positive-HCC patients had lower MDA levels compared to the tumor and surrounding non-tumor tissues of HBV-negative samples, respectively (53). This conclusion may imply the unanticipated impact of HBV infection on decreasing MDA levels in hepatic tissue. The HBV-positive-HCC had higher levels of conjugated dienes compared to the HBV-negative-HCC at the site of non-tumor tissues (53). Additionally, lipid peroxidation products may be used as prognostic factors, as proposed by a study in patients with acute viral hepatitis B (AVHB). This study revealed intensified lipid peroxidation (conjugated dienes and keto-dienes) in AVHB patients with symptoms of acute hepatic encephalopathy but not in others without such symptoms (54). Thus, lipid peroxidation products were introduced as potential candidates for disease progression and prognosis. Another study in which patients with acute or chronic hepatitis B whose plasma MDA levels were positively correlated with the MELD scores (r = 0.588) also supported these candidates (55). Even though various studies have been performed in this field, future studies could focus more on measuring other lipid oxidation byproducts rather than MDA and also evaluating their hepatic concentrations rather than their plasma values. Excessive free radicals could also damage proteins by various modifications. Protein oxidation byproducts mostly include sulfur oxides, protein hydroxides, 3-nitrotyrosine, and carbonyl derivatives (56). Among them, carbonylated proteins (protein CO) are the preferable marker for oxidative stress as they are produced earlier and are more stable (57). In contrast to lipid oxidation, studies on protein oxidation are sparse despite the fact that protein oxidative products are relatively stable and suitable markers of oxidative stress (58). Moreover, protein oxidation byproducts could offer valuable clues regarding the source and severity of oxidative stress. For instance, nitrotyrosyl residues indicate the presence of nitric oxide and superoxide (59) or cholortyrosine residues, which are produced by HOCl and address the presence of neutrophils and/or monocytes (60). In a study done by Namiduru et al. (20), no significant difference between the plasma nitrotyrosine levels of healthy individuals and chronic viral hepatitis B patients were reported. In contrast, Meng et al. (61) demonstrated a significant increase in the serum nitrotyrosine levels of patients with chronic hepatitis B. However intrahepatic nitrotyrosine accumulation has been reported in patients with viral liver diseases but not in non-viral diseases (62). These findings indicate that there is an increased amount of nitric oxide in the hepatic tissue of patients with viral liver diseases, although this accumulation might not always be reflected in the patients’ plasma or sera. Carbonyls can be produced by almost all ROS species and therefore do not reflect the source of oxidation; however, since their production is difficult, their presence indicates severe oxidation is already taking place (58). In a study performed by Tasdelen et al. (32), a significant carbonyl level increase was identified in chronic active and inactive hepatitis B patients compared with the controls. They also noted a mild to moderate correlation between HBV DNA and carbonyl levels, which indicates that several degrees of oxidative stress occur in hepatitis B infection. Additionally, Popadiuk et al. (63) revealed significantly enhanced plasma carbonyl levels in children with chronic hepatitis B infection. Moreover, increased plasma carbonyls were also noted in patients with HBV-related HCC (64). Therefore, there is great value in measuring protein oxidation products. Increased levels of each product could shed some light on the underlying pathogenesis of the disease. Each protein has a unique function that leads to a unique dysfunction if modified. Therefore, more attention should be focused on protein oxidation. There is no one single best method for measuring protein oxidation and each measurement has its own meaning. Free radicals could generate various DNA lesions, which in turn may lead to mutations and genome instability (65). There are several oxidatively produced DNA lesions; 8-oxo-7, 8-dihydro-2’-deoxyguanine (8-oxo-dG) is the most suitable to be measured as an oxidative marker (66). Shimoda et al. (67) reported an increased formation of 8-hydroxydeoxyguanosine (8OHdG) in human livers with chronic hepatitis (including hepatitis B samples). They also showed a significant correlation between the 8OHdG content and serum ALT levels in non-cancerous liver tissues. Furthermore, an increase in the oxidative DNA damage was shown in patients with chronic viral hepatitis B (CVHB) as the disease progressed from the earlier (F1) to the later stages (F4) and eventually led to HCC. This increase, evaluated by hepatic oxo8dg, became significant at advanced stages when compared to CVHB patients with no fibrosis (F0) (68). Another study revealed extensive DNA damage in the liver tissues of chronic HBV patients by means of 8OHdG immuno-labeling (69). Increased urinary 8OHdG in patients with chronic hepatitis B has been observed as well (70). Even a model of HBV infection in transgenic mice displayed extensive oxidative DNA damage as a measurement of oxo8dG (71). The assessment of the hepatic 8OHdG levels from the tissue samples of both CVHB and chronic hepatitis C (CVHC) patients indicated extensive DNA oxidation occurring in the liver, especially in patients with hepatitis C. This hepatic 8OHdG reactivity was strongly correlated with ALT (r = 0.506), AST (r = 0.515), HBV-DNA titers (r = 0.540), and age (r = - 0.559) in chronic hepatitis B patients (72). Moreover, DNA damage was shown in the peripheral blood lymphocytes of both chronic and occult hepatitis B patients. This genotoxicity of HBV was indicated by the increased phosphorylation of histone variants H2AX, ATR/ATM, and p53 (73). Although these studies confirm the presence of DNA oxidation and damage in HBV, further studies should focus more on DNA oxidation, as it is the most important prerequisite for mutagenesis and cancer development. Due to their instability, ROS/RNS species, which originate from multiple enzymatic and/or non-enzymatic sources, are difficult to directly measure. However, few studies have measured their production in HBV patients. For example Bhargava et al. (73) reported increased ROS levels in lymphocytes of chronic and occult (HBsAg negativity + positive HBV DNA < 100 IU/mL) hepatitis B patients. Wang, K. et al. (74) showed increased NO levels in CVHB, although Guler et al. (39) did not find any significant differences compared to healthy controls. Moreover, in a study on patients with HBV-associated HCC, significant elevation of superoxide anion radicals was observed (29). This increase in superoxide anions was also seen in the leukocytes of patients with CVHB (75). Although this parameter is difficult to measure, further studies in this field could reveal correlations between ROS/RNS production and hepatitis B disease activity. Several enzymes are known to generate ROS/RNS species, such as NADPH oxidase (NOX family), myeloperoxidase (MPO), xanthine oxidase, etc. Studying the levels and activities of these enzymes as a major source of oxidative stress in hepatitis B patients could facilitate a better understanding of the role of redox status in this infection. ROS-generating enzymes are obviously “the elephants in the room” that should not be ignored. MPO, one of the major ROS-producing enzymes, catalyzes hydrogen peroxide into a range of various reactive oxygen species, such as hypochlorous acid (HOCl) (76). Therefore, MPO, which is easily measured, is a great and promising biomarker of oxidative stress (77). Considering the extensive amount of oxidation seen in hepatitis B patients, one may presumably predict a very high level of plasma MPO B. Impressively, the opposite was true. When compared to healthy controls, patients with hepatitis B exhibited significantly decreased plasma MPO levels (20, 32); this decrease was shown to have a significant negative correlation with the HBV DNA levels and was observed in both active and inactive hepatitis B patients (32). However, these findings were reported by analyzing the plasma of hepatitis B patients; and neither study measured the MPO levels in the hepatic tissue itself. Therefore, this unexpected correlation could probably be attributed to the site of sampling, as was done in another study of hepatitis C patients, where the tissue MPO activity was increased in comparison to controls, whereas the plasma MPO activity was not (78). Another explanation could be the severity and progression of the viral disease. A study by Mohamadkhani et al. (79) revealed a significant increase in the mean plasma MPO levels in patients with HBV-related cirrhosis, whereas no significant difference was noted between healthy controls and patients with CHBV. Additionally, a positive correlation was seen between plasma MPO and liver fibrosis. Therefore, it seems that the MPO plasma levels might be useful predictors of disease progression. However, patients’ plasma levels might not increase significantly until cirrhosis has already emerged. Conversely, Guler et al. (39) revealed a conflicting result in which a significant increase in serum MPO was observed in chronic active and inactive hepatitis B compared to healthy controls. MPO was also positively correlated with the patients’ DNA and ALT levels. All in all, further studies are indicated to clarify the exact situation of MPO in hepatitis B.
Xanthine oxidase is another ROS/RNS-producing enzyme that is also involved in the metabolic pathway of uric acid. Significant increases in plasma xanthine oxidase levels were shown in patients with CHBV and HBV-related liver cirrhosis compared to healthy controls (31). Another study also revealed a significant increase of xanthine oxidase in both active and inactive CHBV patients (21). Both studies reported a significantly positive correlation between xanthine oxidase and the total bilirubin levels (21, 31). Moreover, xanthine oxidase was shown to be significantly higher in CVHB patients with the C genotype compared to the B genotype (80). The inhibition of xanthine oxidase using drugs such as allopurinol might be proposed as an adjuvant therapy, especially in those with elevated total bilirubin levels. However, future studies will be needed to determine the effectiveness of this potential therapy. Generally, studies in this field are lacking, and further attention should be paid to these and other ROS-producing enzymes. One of the most inspiring laws of chemistry is the Le Châtelier principle, which emphasizes that a system in equilibrium will remain in equilibrium indefinitely unless it is disturbed. The human body normally maintains its own equilibrium using oxidants and antioxidants, which should always be in equilibrium unless disturbed (10) by one of the omnipresent environmental stressors that surround us in our everyday lives (81). These stressors could not only be free radicals themselves but also might contribute to the formation of a cascade of free radicals (82), which could eventually bring our physiologic equilibrium state to a pathologic state called oxidative stress: a state which is said to be associated with over 100 diseases (83). However, there is a chain-breaking component (82) on the other side of the equation: antioxidants. This defense system could easily counteract oxidative damage and restores the state of equilibrium. Furthermore, this defense system can and should be reinforced from the outside. Our antioxidant defense system consists of two synergistic compartments: endogenous antioxidants (e.g., glutathione, catalase, superoxide dismutase, glutathione peroxidase, etc.) and exogenous antioxidants (82). Our defense system would be incomplete without the presence of exogenous antioxidants, such as vitamin C, vitamin E, carotenoids, polyphenols, etc. Without doubt, gaining a better understanding of the antioxidant status in hepatitis B and revealing the effects that antioxidant adjuvant therapy has upon it will make our perception of this disease clearer than before. Table 2 summarizes studies that have revealed the status of some antioxidants in patients with hepatitis B (21-24, 27-29, 31-34, 37-39, 41, 43, 44, 46, 48, 49, 53, 61, 63, 64, 73, 80, 84-93). Table 3 shows several studies on the effect of some antioxidant therapies in patients with hepatitis B (94-102). Abbreviations: CVHB, chronic viral hepatitis B; HBV-LC, hepatitis B-associated liver cirrhosis; HBV-HCC, hepatitis B-associated hepatocellular carcinoma; AVHB, acute viral hepatitis B; HBV, hepatitis B virus; ALT, alanine aminotransferase; AST, aspartate aminotransferase; ALP, alkaline phosphatase; GGT, Gamma-glutamyl transferase. As shown in Table 2, several studies have revealed an antioxidant deficiency in hepatitis B patients, which is harmful for the body and likely, hinders treatment responses. Therefore, this antioxidant defense system should be reinforced to reduce oxidative stress and improve treatment outcomes. However, clinically, the desired treatment outcomes are not always reached. For example, one study stated N-acetylcysteine was a safe and effective adjuvant therapy for hepatitis B (99), whereas another concluded the exact opposite (Table 3) (98). Other controversies have also been seen in antioxidant levels. For example, some researchers have reported decreased levels of glutathione peroxidase (22, 32, 89), while another study found an increase (90). This unexpected rise may be attributed to a compensatory mechanism typically seen at the beginning of a disease. A similar condition was also reported for glutathione, which is expected to be decreased in the plasma of patients with hepatitis B. A study by Kulinsky et al. (88) reported an increase in plasma glutathione in acute hepatitis B. However, a closer look at acute hepatitis B patients indicated that although the plasma glutathione level initially increased, it began to fall as the disease became more severe and chronic. In other words, in chronic hepatitis B and severe acute hepatitis B patients, the plasma glutathione levels were decreased. Simultaneously, erythrocyte glutathione was always decreased at all stages. This recent study signifies the importance of separately analyzing the two different glutathione systems of plasma and erythrocytes. Furthermore, it also implies that unexpected findings may disappear as the disease progresses and becomes more severe and/or chronic. The probable compensatory mechanisms, which are mostly active at the beginning of the disease, start to fail as the disease course progresses. For another example, Wang et al. (24) revealed that ascorbic acid (vitamin C) was elevated in chronic hepatitis B patients with normal ALT levels, which was not anticipated because antioxidants are expected to be decreased. However, there was also a significant negative correlation (r = - 0.64) between ascorbic acid and ALT in patients with chronic hepatitis B. We believe that the conflicting results seen in the status of different antioxidant levels in patients with hepatitis B might at least partly be explained through our concept of “compensatory gaps,” which is a period in the disease’s course in which the antioxidant level/activity increases due to compensatory mechanisms. Whenever the gap ends or “has failed,” the antioxidant levels begin to fall below normal values. Each antioxidant likely has its own specific compensatory gap. Figure 2 demonstrates the concept of compensatory gaps, which we suppose might be a prime suspect for the divergence and inconsistency of the results seen regarding the antioxidant status of hepatitis B patients. During the primary phases of the disease, the antioxidant level starts to increase as a compensatory response. 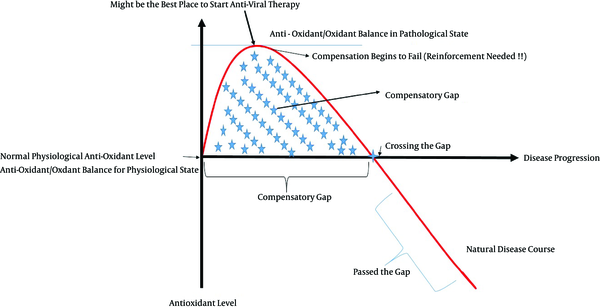 As the disease progresses, the compensation begins to fail; eventually, the antioxidant level declines to below its normal values (gap ending) unless externally reinforced. Notice that the x-axis does not represent time but instead signifies the disease progression, which is determined using scored phases. Notice that the x-axis is shows the disease progression and does not represent time. Therefore, one patient might be in the compensatory gap for a specific antioxidant for 20 years, while another patient might pass the gap of the same antioxidant in several weeks due to a more rapid progress of the disease. 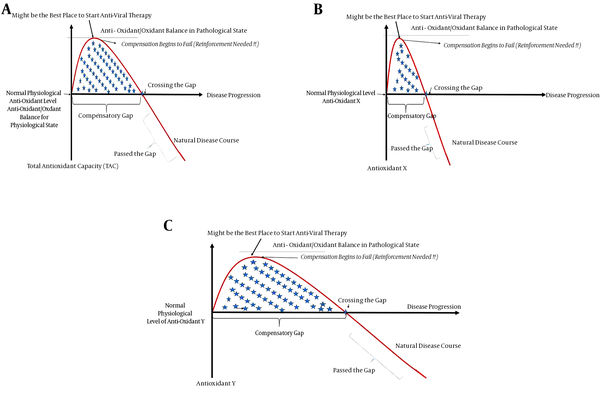 Therefore, time is not the determinant of when the compensatory gap has ended; instead, the gap ending is a result of the disease progression, which should instead be classified into different phases (“phase-oriented”). Solely classifying patient groups as “active vs. inactive,” or “chronic vs. acute,” etc. probably will not reveal the enigmas behind antioxidant status in hepatitis B. Therefore, we propose that future studies should be phase-oriented. This phase determination should be carried out using a scoring system, which considers a variety of factors, such as the patient’s past history of fulminant hepatitis, HBV DNA levels, ALT, fibrosis score, etc. (Figure 3). As a result, a patient with chronic active hepatitis B might be in the same phase and be given the same score as a patient with HBV-related HCC. The disease duration does not solely reflect the phase; other factors should also be considered (Figure 3). It will also be important to consider past stages the patient has passed. For example, patients A and B might both be currently inactive carriers, but because patient B has passed an episode of acute fulminant hepatitis B, the compensatory gaps are over, whereas patient A is still going through its compensatory mechanisms. Extensive further studies are crucial to develop such a scoring system for phase determination. Patients should eventually be grouped homogenously according to their disease phase (score) and be followed up accordingly. Otherwise, conflicting results will occur. Furthermore, it should be emphasized that each antioxidant probably differs in its compensatory gap; while the compensatory gap of one antioxidant may have ended, another antioxidant might still be in the gap (Figure 4). For example, in a study of patients with HBV-associated HCC who had been HBV carriers for 20 years (29), it was shown that the superoxide dismutase levels (antioxidant) were increased (and these patients were therefore likely still in the compensatory gap), whereas glutathione, vitamin C and vitamin A were decreased (these patients had probably passed the gap) and glutathione peroxidase and vitamin E had no significant change (likely crossing the gap). These findings were all probably due to specific but different compensatory gaps that antioxidants may have; external factors might also shift these gaps further to the right or left due. However, if this situation is left untreated, all compensatory mechanisms will eventually fail, and oxidative stress will be the eventual winner. Other factors, such as the methodology, sample size, statistical analysis, site of sampling, past disease course, study group, carrier state, etc., could produce conflicting results. Nevertheless, these controversial results imply that the complex process of oxidative stress is taking place. Further comprehensive studies will be needed to determine the exact role of different antioxidants in hepatitis B. Half a century has passed since the debut of the development of antiviral drugs (103). However, only six drugs have been approved by the FDA for the treatment of hepatitis B since then: Immune modulators, such as interferon alpha (i.e., conventional INF-α 2a, conventional INF-α 2b and peglayted INF-α 2a); and direct antiviral drugs, including Lamivudine, Adefovir, Entecavir, Telbivudine, and Tenefovir (7). All of these drugs except for interferon alpha must be consumed for a prolonged period of time. Determining the effects of these drugs on oxidative stress could contribute to their further improvement, resulting in the development of more antiviral drugs and possibly leading to the implementation of neo-adjuvant therapies. However, information available in this field is scarce; further attention should go toward investigating the effects of antiviral therapy on oxidative stress in hepatitis B patients, especially for the administration of oral drugs. Fan et al. (18) revealed a significant decrease in the serum MDA levels of hepatitis B patients following treatment with interferon alpha-2b. Furthermore, a significant increase in the total antioxidant capacity was also observed in the responsive group receiving interferon alpha-2b but not in the unresponsive group, which indirectly implies the role of the antioxidant system in treatment outcomes for hepatitis B patients. The combination of interferon-alpha and lamivudine has also revealed a decrease in lipid peroxidation products as well as a simultaneous increase in antioxidant enzymes (25). Another study on hepatitis B patients who were receiving interferon-alpha also reported an increase in their glutathione and beta-carotene levels along with a reduction in MDA levels following treatment (19). Although not a FDA-approved immune-modulatory drug, thymosin alpha has been shown to decrease NO and xanthine oxidase and increase superoxide dismutase in a rat model of steatohepatitis (104). However, studies on this drug with regards to oxidative stress in hepatitis B are sparse; further investigation should focus more on this subject. The administration of antiviral drugs appears to fortify the antioxidant system and to simultaneously decrease oxidative stress, thus implying the probable influence of antioxidant therapy on treatment outcomes. However, a study done by Cicek et al. (105) showed no significant differences between total antioxidant status and total oxidant stress six weeks before and two weeks after patients with chronic viral hepatitis received interferon alpha. This study did not separate HBV and HCV patients, and its measurements were obtained only two weeks after therapy; there were no longer-term follow-ups. In contrast, Dikici et al. (19) reported a complete resolution of increased oxidative stress six months after INF-α therapy. Therefore, longer follow-ups should always be considered for future studies, and further investigations are needed to determine the effect of antiviral drugs on redox status. Our review clearly confirms the presence of ongoing extensive oxidative stress in the pathogenesis of hepatitis B. This oxidative process occurs at all levels, including lipids, DNA, and proteins. Therefore, the use of antioxidant therapy as an adjuvant therapy in hepatitis B should be very promising both for itself (hepatitis B) and at reducing its associated complications (e.g., HCC). However we should not forget that antioxidants could act as double-edged swords (106). An antioxidant that is typically beneficial could become unexpectedly deleterious if it is consumed at the wrong time, in the wrong place, or at the wrong dosage and could produce unforeseen and conflicting results. This property of antioxidants may partly explain the ineffectiveness of some antioxidants reported by some studies. For example, epigallocatechin-3-gallate (EGCG), an antioxidant present in green tea, causes oxidative damage in the presence of transition metals (107). Future studies will therefore need to consider other factors, such as the Ph or ferritin levels to distinguish conflicting results. As another example, vitamin C at high doses (500 mg/d) has revealed pro-oxidant activity (108). The wrong combination of antioxidants could also produce controversial results. One study showed that beta-carotene plus retinol increased the incidence of lung cancer in smokers (109). However, another study that used beta-carotene alone reported the opposite effect (110). Therefore, antioxidants can easily become pro-oxidants if consumed improperly. The amount and spectrum of oxidative stress in hepatitis B are so extensive that one might always expect beneficial results from whatever antioxidant is given in hepatitis B. But in reality, this is not the fact because determining the right antioxidant to be used at the right time and in the right place is very complex. As a result, we emphasize that further studies should focused on natural compounds from foods or plants rather than synthetic antioxidants. These natural compounds are not only safer but also possess synergistic or additive actions resulting from their complex mixture of antioxidants. Our review also showed that hepatitis B patients are generally low in many antioxidant levels before initiating treatment. However, it has also been shown that responsive antiviral treatment groups experienced a significantly increased total antioxidant capacity and decreased levels of oxidative stress (18). There is also evidence that hepatitis B virus X protein (HBx) induces the activation of a set of transcription factors via ROS (oxidative stress), which eventually leads to gene expression in the nucleus (111). ROS can also increase HBV capsid assembly as found in HepG2.2.15 cells (112). Therefore, according to these recently mentioned facts, reducing oxidative stress prior to antiviral treatment may improve treatment outcomes and response rates and possibly lead to viral elimination. 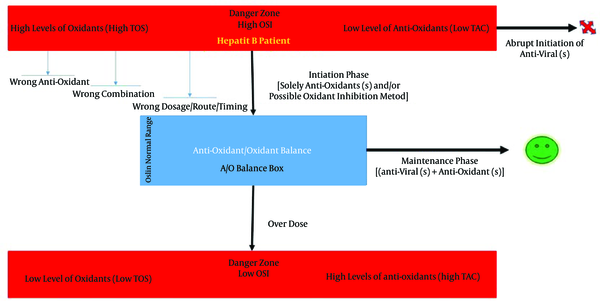 Hereby, we propose that antioxidant therapy in hepatitis B could follow a new two-step approach called the “2-step Combined Antioxidant Adjuvant Therapy for hepatitis B (2CAAT Hep B)”. Step one is the “initiation phase,” which focus on compensating and strengthening the deficient antioxidant system or capacity of the patient before starting any antiviral treatment. As said, patients with hepatitis B are depleted in many antioxidants. Ideally, it will be preferable to individualize this step so that each and every patient will be compensated for only what antioxidants she or he is deficient (goal-directed). However, performing an investigation in this manner is challenging and likely impractical due to the complex endogenous antioxidant system inside our body. Therefore this step should be at least partly monitored by measuring the Oxidative Stress Index (OSI), which is calculated using the total oxidant status (TOS) and total antioxidant capacity (TAC) [OSI = TOS/TAC]. The OSI is dependent on both the TAC and the TOS. Thus, because high oxidative stress is already present in hepatitis B patients, one should increase the TAC, which is typically below its normal value in pathological states, in order to compensate and normalize OSI. However directly (e.g., gene therapy, inhibiting ROS-producing enzymes, decreasing the ROS/RNS producing mechanism, etc.) or indirectly (probably resulting from an increase in the TAC) lowering the TOS will have the same effect on normalizing the OSI and might be considered instead of or as an adjunct to increasing the TAC. Solely administrating a combination of antioxidants may not lead to a higher TAC, as occurred in a group of cirrhotic patients where the supplementation of exogenous antioxidants did not produce a higher TAC (113). By normalizing the OSI, we could assure the full achievement of step one, which may be accomplished with natural or synthetic antioxidants or a combination of both. However, it is generally preferable to acting according to the most up-to-date information available on the status of endogenous antioxidants in hepatitis B patients. Fulfilling this step not only may be beneficial by itself but could increase the response to antiviral treatments. Further studies will also be required to determine the normal and desired range for OSI. The second step of this approach is the "maintenance phase", which focuses on the ongoing oxidative stress in hepatitis B. This step counteracts further oxidative damage and should preferably be achieved using natural compounds. As mentioned previously, oxidative stress in hepatitis B is a complex multi-level process; neutralizing it with natural compounds, which are a complex mixture of antioxidants, seems more reasonable and promising. This step should also be at least partly monitored by measuring the OSI. Keeping this index in a desired range will reassure the fulfillment of this step. This step will probably accompany ongoing antiviral treatment. Other comprehensive indexes may be used instead of the OSI. However, the main point of this approach is first to efficiently strengthen the antioxidant defense system (evaluated by OSI) and then initiate an antiviral treatment alongside with an ongoing antioxidant therapy. Figure 5 schematically demonstrates the two-step approach. As shown, hepatitis B patients are mostly at high levels of oxidants (high TOS) and low level of antioxidants (low TAC). The initiation phase targets this situation with the correct antioxidant (± oxidant inhibitor) therapy to normalize the OSI. If the wrong selection, combination, timing, or placement of antioxidant therapy occurs, the OSI will not reach the desired values and the initiation phase is considered to have failed. After OSI normalization, the maintenance phase kicks in to counteract ongoing oxidative stress (i.e., maintain the OSI in the desired range) and initiate antiviral treatment. Notice that if a patient with hepatitis B already has a normal OSI due to the compensation gaps, she or he will not require antioxidant therapy as a prerequisite. Therefore, excessive antioxidant therapy will lead to a situation where antioxidants become pro-oxidants. One of the main limitations of reviewing publications in this field is the wide heterogeneity and bias that is often seen. The vast diversity observed among studies is because they use different antioxidant therapies, calculate different indices, measure a variety of different antioxidant/oxidant markers, and use variable setups. These discrepancies make it more difficult to unite all these results and reach a comprehensive conclusion. It is also not feasible to mention each and every study done in this field. Therefore, in addition to proposing a new approach, we also suggest developing an international platform and database for antioxidant adjuvant therapy in hepatitis B. This platform allows for standardized research and data analysis in this field. For many years, much money has been spent, but no great achievement has been made in the field of antioxidant therapy for hepatitis B. A meta-analysis conducted in 2010 concluded that there was no evidence to support or refute antioxidant therapy in liver diseases (114) despite the fact that oxidative stress plays a major role in the pathogenesis of hepatitis B. Therefore, the time is right to canalize our research in a standardized direction. This review specifically concentrated on hepatitis B, which allowed for a more detailed approach. We believe that reviewing diseases individually will be more productive, especially when complexity is a problem (79).